In the span of a few blocks of Manhattan’s Lower East Side, residents and visitors can find themselves sipping wine at a gallery opening, shopping for knockoff purses, touring historic tenement apartments, and ending up at high-end boutique or $3 dumpling shop. More than any other neighborhood in New York City, the Lower East Side is known for it’s remarkable diversity and rich artistic culture. But now more than ever, store owners and residents fear that growing numbers of affluent middle-class transplants are threatening the area’s unique character. Just as the Lower East Side was transformed from immigrant neighborhood to counter-culture capital in the 1960s, the area has been going through another massive shift. 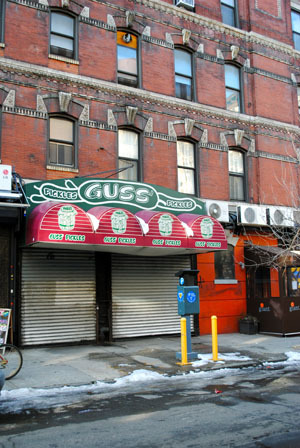 Middle-class residential upgrades have pushed out artists and longtime businesses, such as Guss’ Pickles on Orchard Street near Delancey Street. The pickle shop has sold some of the city’s most renowned pickles for more than 89 years, when Polish immigrant Isidor Guss began selling his products out of a pushcart on the Lower East Side. But in the beginning of this year, Guss’ finally buckled under the pressure of increasing rent prices. Owner Patricia Fairhurst decided to move from Orchard Street to Borough Park in Brooklyn. Steve Liebowitz, owner of United Pickle Enterprises based in the Bronx, is also sole owner of the Guss’ trademark and name. In a contentious court battle, Fairhurst lost all rights to use the name when she relocated. 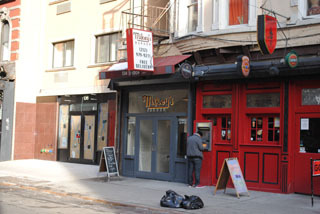 He believes that the Orchard Street Guss’ is moving to Brooklyn for another reason. Whether the rent or the quality of their pickles drove them out of the Lower East Side, Guss’ did manage to hold on long enough to see the block change completely. Now, the neighborhood institution seems out of place. Upscale boutiques and specialty shops — a spa frequented by celebs, a coffee shop that roasts its own beans, a shoe store that only sells items made from organic materials — have overshadowed the red pickle barrels that once crowded the narrow sidewalk. Even though the pickle shop is moving to Brooklyn, 88 Orchard, the expensive café directly across from the old location, includes Guss’ famous half-sours with their $11 gourmet sandwiches. While some residents are angered by the displacement of shops like Guss’, others are resigned to the fact that the neighborhood’s shifting landscape is inevitable. Potter, whose burger spot opened only a few months ago, is pleased with some of the changes. The same influx of affluence that fuels the success of upscale restaurants is helping business for small boutiques in the area. While it’s still possible to buy a fake-leather coat off the street, the ‘bargain district’ title is becoming less and less appropriate as fashionable clothing stores displace old discount emporiums. Isidoro A. Francisco, 29, is also happy with the way business is being affected. An employee at Yumi Kim, a designer boutique opened in 2008, he is still concerned that his clientele, among others, are taking away from the neighborhood’s distinct identity. Francisco noted the arrested development of several hotels in the area, such as Hotel Ludlow and developer Morris Platt’s plan to build it at 180 Orchard St. Once these developments gather momentum, he said, Lower East Side culture will face a serious blow. “The Lower East Side still has its edge, but it’s only a matter of time until it loses it,” he said. Great article, hey I came across this story while surfing for music events. Thanks for sharing I’ll tell my friends about this too. this post its very usefull thx! I stumbled onto your blog and read a few post. I like your style of writing. I’m delighted! It’s refreshing to see someone very chuffed about what they do. Keep up the great work and I’ll return for more! Cheers! Amazing Dude, that is extremely good information, thankyou. Is this for real? So sad. Thanks a lot for the article. Nice post. Love to share this one.